Many a Tokyo artist and hipster have supped at this cherry wood counter. Tucked away in a pocket of Nishi Azabu, right in the thick of the bustling bar district, is a cosy and private eatery called Tokuyama. The very humble and jolly chef serves up delicious seafood creations with market-fresh ingredients to order from a menu or cooked however you like it. 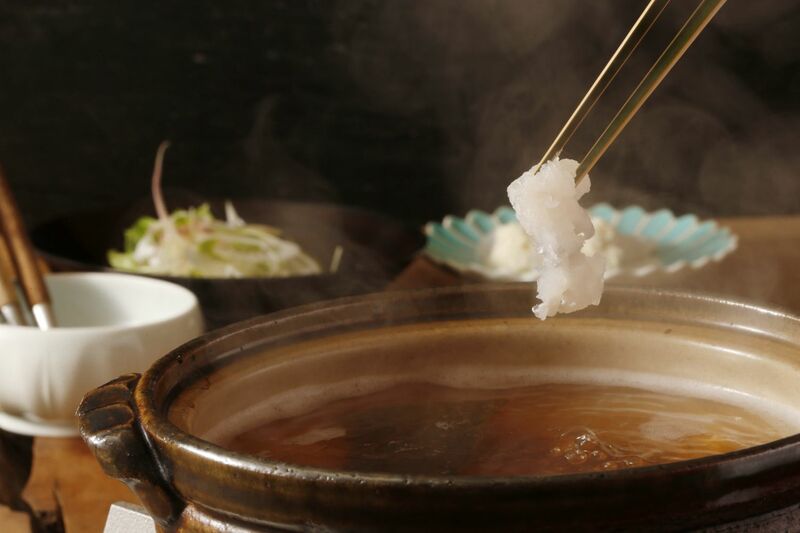 The focus is the mystical fugu, the delicious puffer fish enjoyed in winter, but the menu is filled with seasonal dishes cooked to perfection all year round. The chef’s ultimate joy is making his customers happy. And chances are you will be so satisfied that before long you will be back for more of the comforting goodness. The interior is simple and austere, mostly unchanged since opening in 1967. The cherry tree wood counter has been polished over the decades, soaking up the stories of Showa period artists, photographers and other eminent individuals who have dined here. 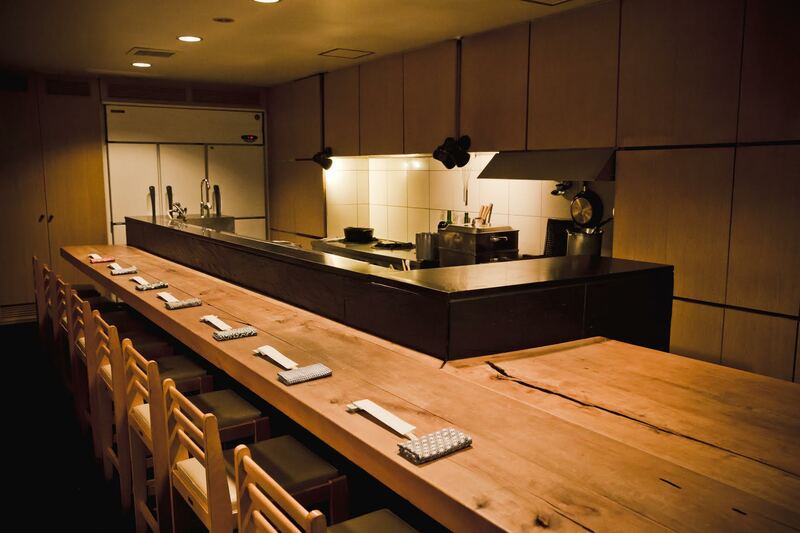 The kappo counter dining setup is historical in itself, as this was the first establishment to serve fugu at a counter. 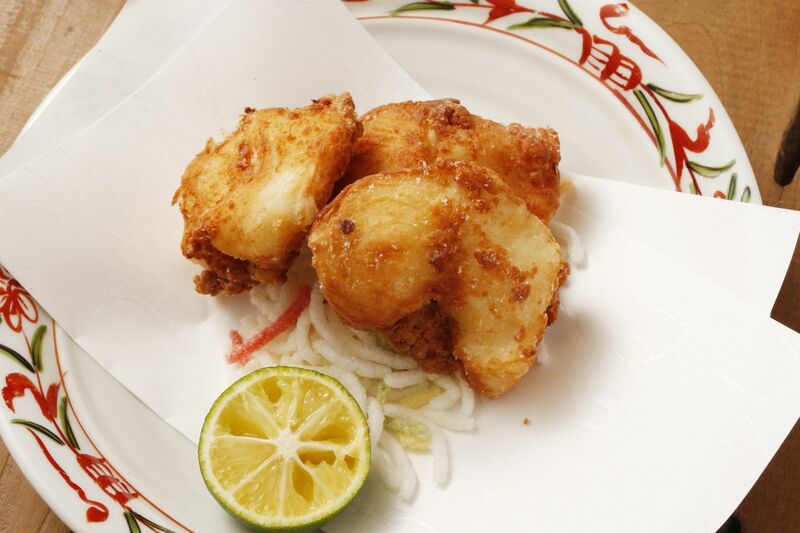 Typically reserved for formal settings, here food lovers could get their fugu fix in a casual atmosphere. Only a small ledge separates you from the chef and his pots and utensils, allowing you to enjoy the craftsmanship and incredible knife work in between dishes. All this is visible even from the small table for four. Seated in an intimate nook with your own group, you still get to enjoy the atmosphere of this friendly eatery. 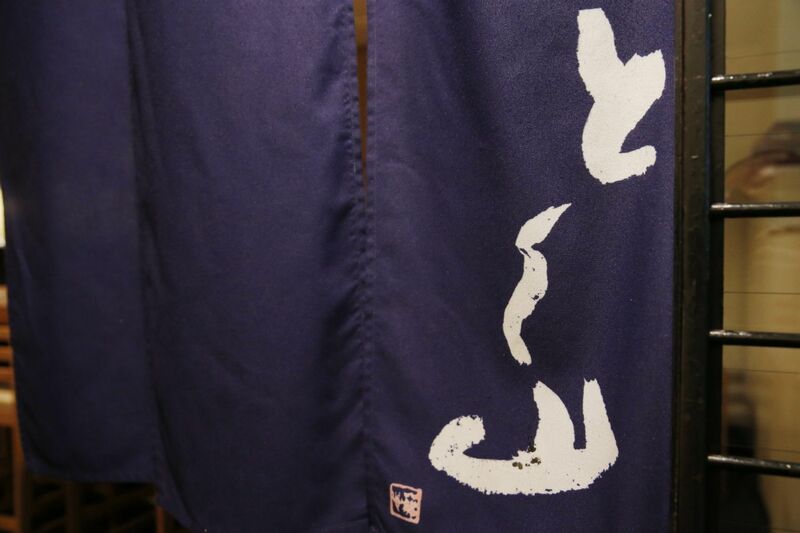 But more than the interior, the thing that strikes most the moment you walk in is the delicious wafting aroma of dashi, reminding you that at Tokuyama, it’s all about the food. Enjoy history of Culinary in Japan. For the first time guest, Chef Ito recommends the omakase (prefix) course. We are accustomed to specifying exactly what we want to eat and how, but you will not be disappointed if you put yourself into Chef Ito’s hands. 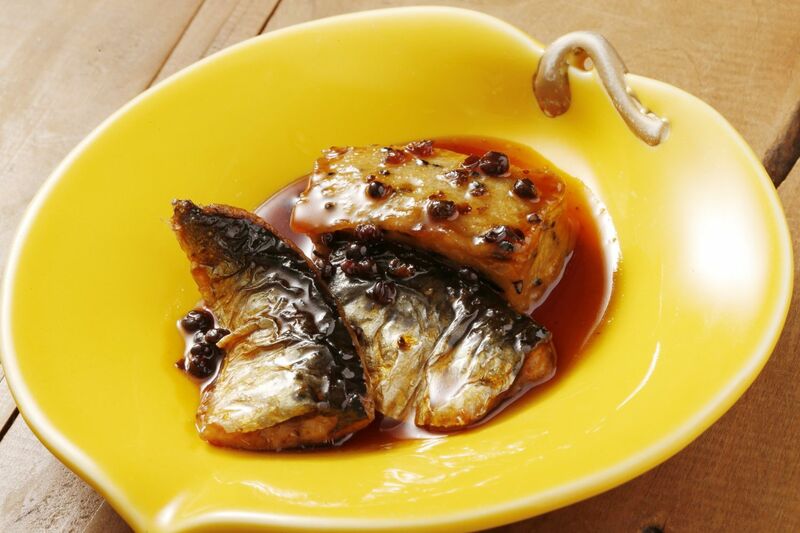 Depending on the season, you might enjoy plump juicy eggplant in a dashi soup garnished with fresh summer greens and myoga, crispy-skinned grilled fish with a tasty knob of miso, tummy-warming clay pot hot pots and of course, fugu in all its forms. Fugu karaage, fugu sashimi, fugu shabushabu. You can see Ito’s love for fugu (puffer fish) when he explains the unique flavors in the different layers and colors of skin versus the flesh and the gelatinous layer in between. He explains that fugu is a fish whose flavor does not overwhelm because the umami is in the protein of the fish, not in fat as with other fish like tuna. The more you chew, the more flavor emerges, and you can experiment with combinations of the condiments of tiny specialty green onions called fugunegi and daidai bitter orange ponzu dipping sauce. Enjoy these flavors with Japanese sake from the Tokuyama’s large selection. Standard favorites and seasonal specialties, served by the glass to match the food and the customer. He suggests trying two varieties at once, tasting the different qualities and noting how they pair with the dishes. 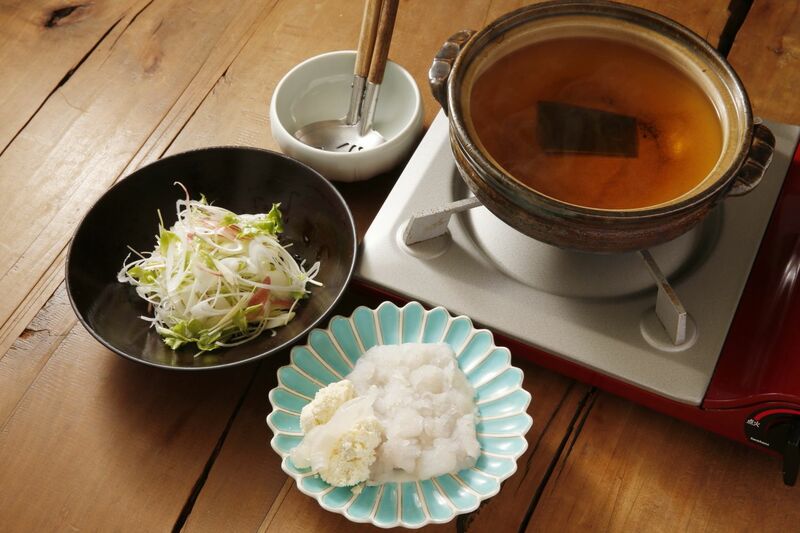 The beauty of washoku is in enjoyment of the passing seasons through the ingredients available. And Japan’s natural environment offers up so many incredible ingredients. You may want to time your visit with the season for hana-zansho (Japanese pepper). At Tokuyama, the season is brief because Ito will only use hana-zansho that passes his very strict test. This also goes for ayu (summer), matsutake (autumn), and shirako (milt), the soft fugu roe available in the cold winter months. Using only charcoal, gas fire or steam, the simple preparations taste amazing. 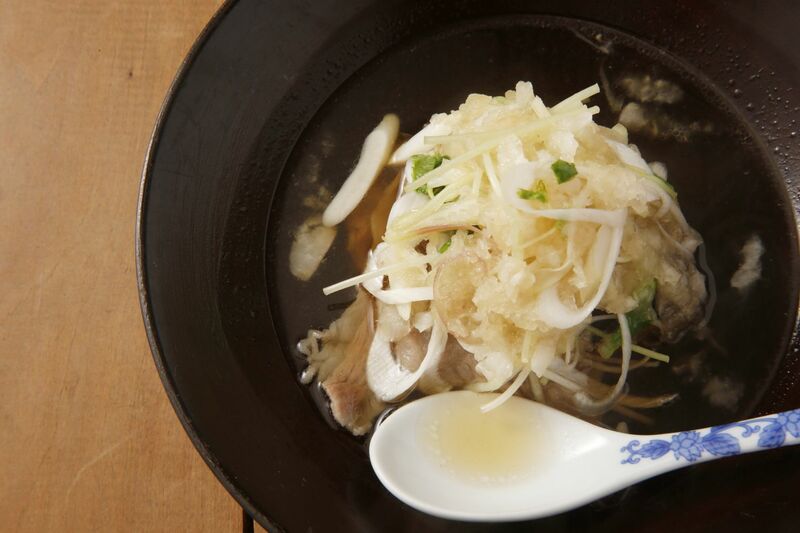 The key to enhancing flavors is a bonito and konbu dashi used in varying proportions depending on the dish, adding deep yet delicate flavor. Even the rice is lovingly prepared, and a personal favorite of the chef’s. When your meal is over you get one more chance to savor the delicious flavors as you devour a Tokuyama onigiri in the comfort of your own home, reliving the lovely dining experience. 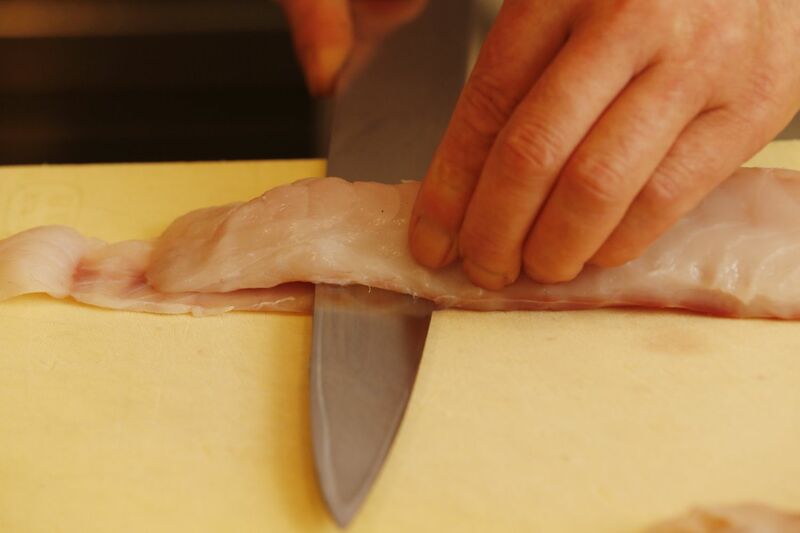 With all the specialist training and years of experience, Chef Ito is a veritable dictionary of all things fugu. 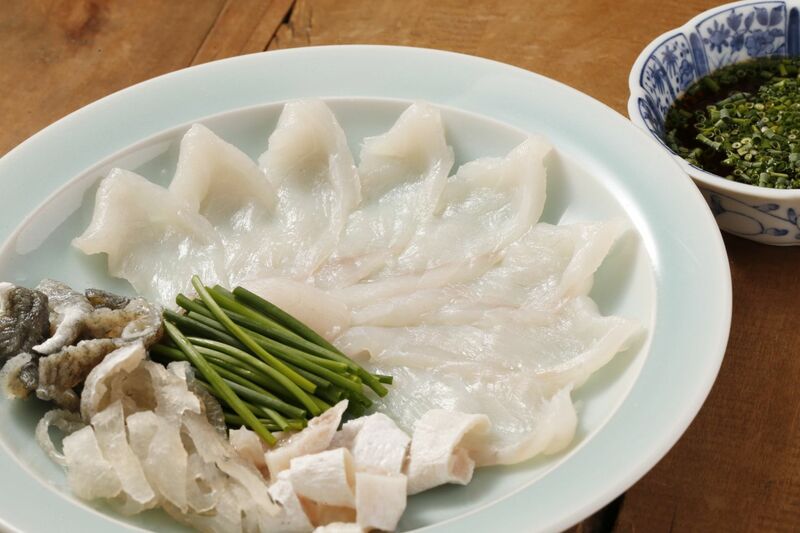 The fugu come from the Seto Inland Sea and have full, elegant flavor. The most prized and largest fugu are called torafugu. They come to him live but he rests them for two to three days after breaking them down to ensure the best texture and condensed flavor. He can take a fish in his hands and feel if it’s ready. The smaller fugu varieties are best fresh the day they come from the market. The flesh is still gently pulsing when it is served, plump and delicious. Ito will not miss a day going to Tsukiji Market. Even if his purchases are all sorted, he goes to greet his suppliers. He feels you get a different level of service and access to the best ingredients only when you nurture relationships in this way. He feeds back customer comments to the fishmongers and even invites them to dine from time to time so they can see customer reactions up close, with their own eyes. Chef Hironao Ito was born in Saitama to greengrocers. He used to accompany his mother to the wholesale markets and help her prepare dinner after the family shop closed its shutters each day. He thought about becoming a carpenter, sure that he wanted to use his hands to create, but delighted his grandmother when he decided to become a chef. Watching the Iron Chef programs, he loved how the chefs took center stage, so he took work at a restaurant and attended night school at Musashino Cooking School. The cooking school career counsellor recommended Ito meet with a man called Chef Nozaki of Tokuyama, now head chef at Waketokuyama. 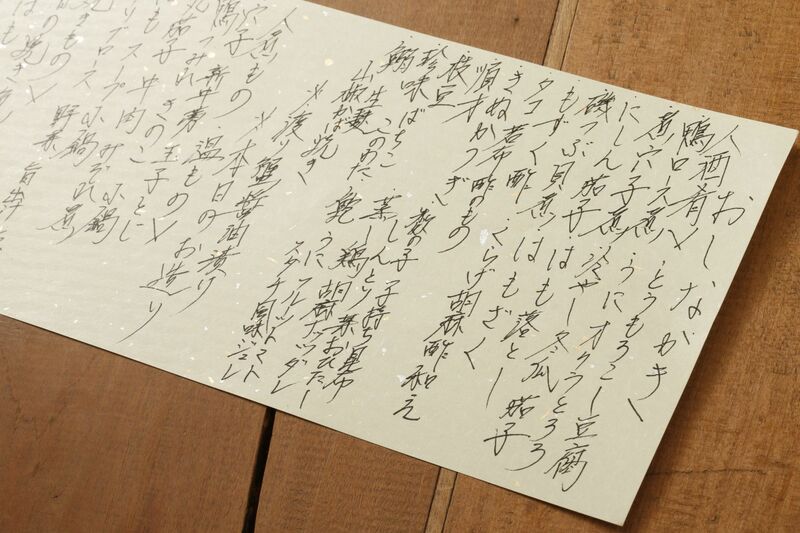 At the interview, Ito was drawn by Nozaki’s smile and his very polite language to all around him irrespective of rank. Nozaki even thanked the young Ito for coming in. Afterwards at a bookstore, as Ito browsed the shelves contemplating working for this lovely man, he was floored to find an entire shelf of cookbooks with his name on it. 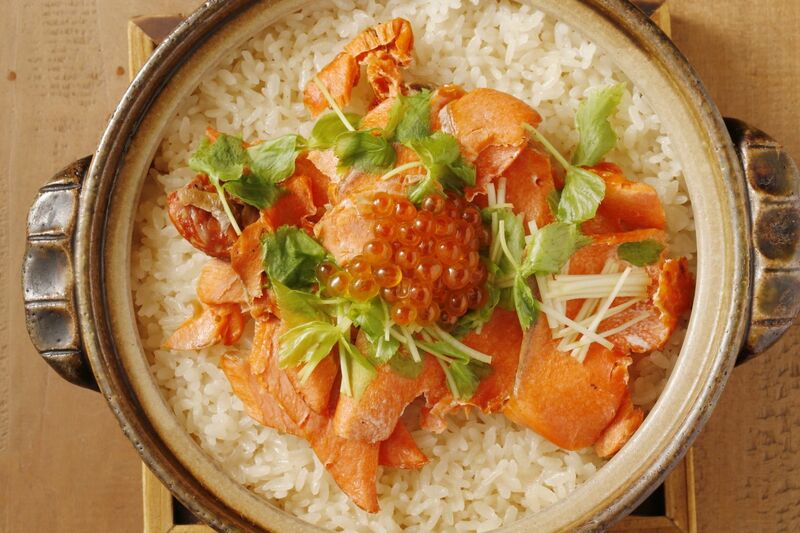 Ito honed his skills under Nozaki’s tutelage before taking over the role of head chef at Tokuyama, serving up delicious authentic cuisine to a broad and dedicated clientele for more than ten years. With just one brief but memorable interlude. Chef Ito was invited by the coach of Japan’s national baseball team to serve as chef alongside Mr. Nozaki at the Athens Olympics in 2004 - the tasty and heart-warming reminders from home perhaps instrumental in the team’s bronze medal finish! Having worked with Chef Nozaki for many years, he has nothing but respect for his diligent mentor – there is never a time when he questions him or talks back because Nozaki so perfectly exemplifies what he expects from his apprentices. Ito takes a lot of pride in those roots and nurtures his relationship with Nozaki, carrying on the craft providing top notch yet accessible cuisine with the same sense of quality and not an inch of arrogance. Content with his place and his team, and ever-wowed by the beautiful seasonal ingredients available in Japan, Ito sees no need to make any great changes. And that is good for us, the customers, because we know we can keep coming back for delicious, satisfying flavors that will stimulate our palate whatever the season. 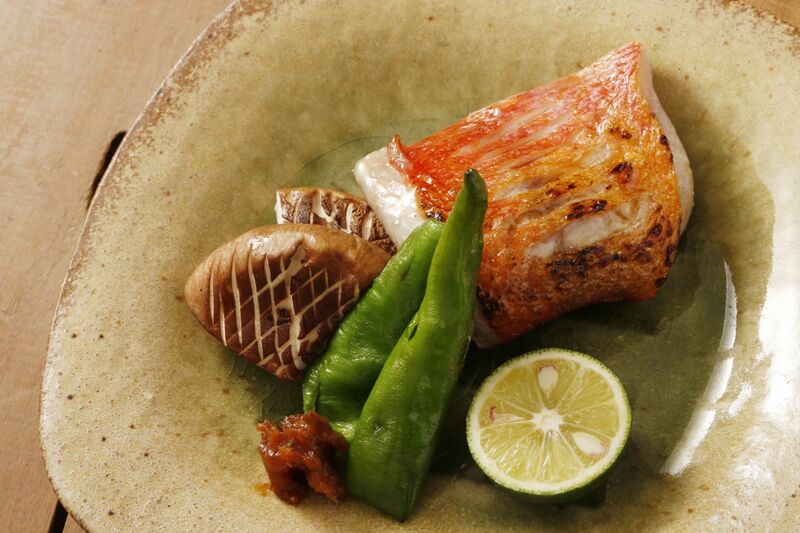 Tokuyama has an eclectic selection of dishes of varying texture, color, and design. 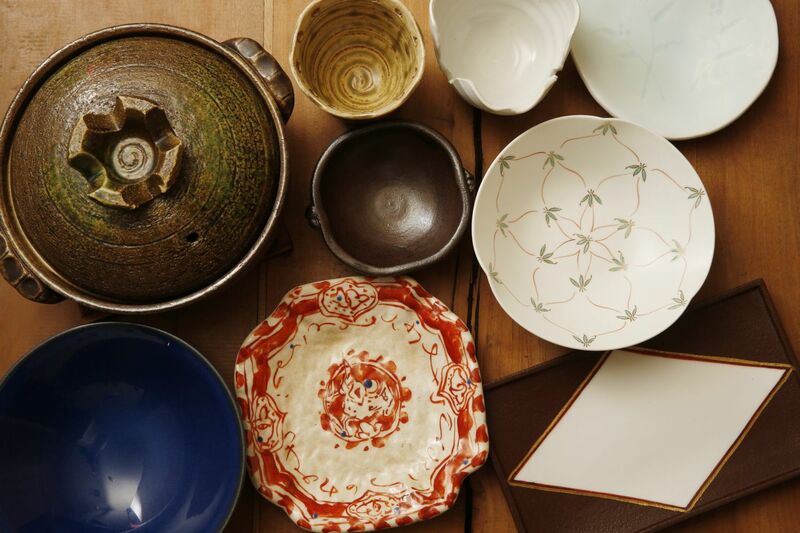 Ito had a little cheeky sparkle in his eye when he said he often pops over to Waketokuyama to take a few dishes to supplement his own collection! 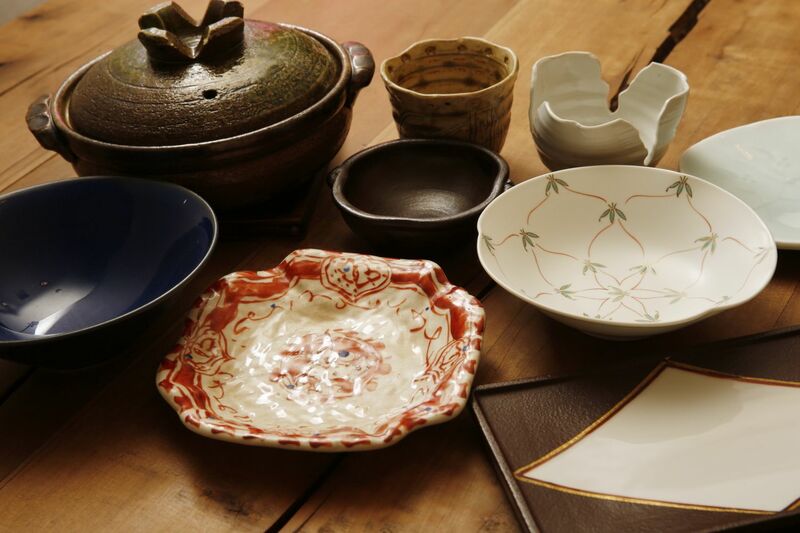 Some exquisite Arita-yaki pieces, a large flat plate for displaying fugu sashimi in a flowerlike design, small bowls for hot bite-size morsels, and dishes for serving up piping hot nabe soup. The clay pots for nabe are not fine ceramics – they need to be hardy and flat-bottomed allowing for even heat circulation. Here again – the quality of the resulting food is paramount.